I try and stay away from writing about John Murtha because every time I do, I feel soiled and violated and no matter how much I scrub and no matter how many times I shower, the filth doesn’t seem to be gone. The man is a lout and he disgusts me and besmirches the names of the Troops all for the Almighty Political Power. He destroyed the lives and the careers of eight of his “fellow” Marines for political expediency and he is one of the subjects in my research in my quest to expose the Dems and Terrorists Syndrome or, DTS. All but one Marine have been exonerated and hopefully the last one will also be cleared…he was once but someone is now trying to save face. Pathetic. Anyway, we have all heard by now that he made the claim that Western Pennsylvania was a racist area namely because Obama is doing poorly there and since he made that statement, Barack began to fair worse. Murtha then went on and said that he really didn’t mean what he said. He is a typical member of the Leftinistra and as Jim O’Neill stated in his article at Canada Free Press in regards to Obama, Murtha is now in the SOP mode by conducting himself as follows: “Obfuscate, misdirect, and downplay all dangerous questions, but most importantly, simply deny.” Murtha is in the OWM…Official Waffle Mode. It isn’t working. Murtha canceled the scheduled debate with his opponent LTC William Russell, of whom Cyber Pastor and myself had lunch with him in DC during a Vets For Freedom event. I also accompanied, by invitation, LTC Russell and at least two Haditha Marines to Murtha’s office in DC. At first, he wasn’t there but then we learned he was there and did not have the time to visit with his constituents but later on had the time to meet with Code Skank. The man, and I use that term very loosely, is a coward. I was there when LTC Russell issued the Debate Challenge to one of Murtha’s “helpers” there in his office and heard for myself that “Rep Murtha always puts the Troops first”. All of us in the group mentioned that we are the Troops and we didn’t see it that way. Now, in light of his political cowardice of not visiting with his constituents that oppose his standings and will meet with constituents and non-constituents that agree with him, and having lied about the Haditha non-Massacre, and calling his constituents racists and then “un-calling” them that, he cancels his debate with LTC Russell. And now…and now the worthless toad Murtha has come out and shot himself in the foot one more time. His district is now not racists but they are rednecks. You have to wonder how residents of Pennsylvania like the descriptive phrases that have been piled on in the past few months. First, it was bitter and God and gun clinging, then it was racist, now they are rednecks. In an interview with reporter David Brown at the Trib today, John McCain took exception to the “good people in Western Pennsylvania’ being framed as racists. “I’m going to tell people in Western Pennsylvania that I don’t believe they are racists, as Congressman Murtha alleges,” said McCain, in the interview. He called the comment “disgraceful.” Murtha, a Johnstown Democrat, has apologized for the racist comments. Murtha last week said that a racist mindset in Western Pennsylvania could cost Obama as much as four percentage points at the polls. No word on McCain’s feelings about rednecks. Well, I know how he feels about it and so does everyone else. Murtha doesn’t and Murtha is in a panic. Nothing will please me more than watching Murtha pack his crap and move out of DC. At the end of the Caine Mutiny, Jose Ferrer delivers that classic line as he flings a glass of champagne into Fred McMurray’s face. The reason for the outburst was McMurray’s character’s cynicism. More at Pittsburgh News with video here…and the Power Line post linked above is gathering data that may be pointing to a LTC Russell win over Murtha, Saints be Praised! I am a M**tha F*****! By now, you all know the story of Lt Col Jeffrey Chessani facing serious charges based on a Time story in which Congressman John Murtha made unfounded allegations against eight Marines, one of whom was Lt Col. Chessani. 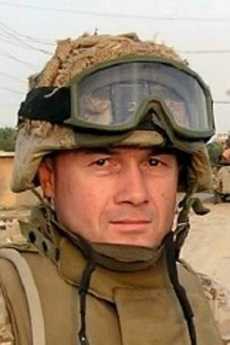 Lt. Col Chessani had his honour and reputation called into question because Murtha said that in a town called Haditha in Iraq, civilians were killed by US Marines “in cold blood”. This event was in November 2005, and it has been a long and sad road to June 17, 2008 when a military judge, Col. Steven Folsom dismissed charges against Lt. Col. Jeffrey Chessani after defense attorneys raised concerns that a four-star general overseeing the prosecution was improperly influenced by an investigator probing the November 2005 shootings by a Marine unit in Haditha. “…The charges were dismissed without prejudice, meaning they can be refiled, but Folsom barred Marine Forces Central Command from future involvement in the case. Like everyone else I have been so outraged at the cavalier treatment these brave Marines have all faced. Of the eight charged, seven have already had all charges dismissed. This case is not in the headlines right now, but I am still outraged. I have thought what positive action we can take. And I have come up with a plan. No, it is not a novel idea, and certainly not unique. But, I am now officially a “M***tha F*****. So far, Congressman Murtha STILL has offered no apology to ANY of these Marines. All over YouTube are videos of his declaring over and over again what criminals these servicemen were. One, we can contact Congressman Murtha and tell him – politely I suppose – what we feel about his actions, and demand he do the right thing; the right thing in this instance begins with a public apology. And if you feel the urge to write him an actual letter? Something he can hold in his dirty hands? Two, you can contribute to Lt Col Chessani’s legal defence funds. He is represented by the Thomas Moore Law Centre. Lt Col Chessani is considering suing Murtha – and he should. Also, in my opinion, Time Magazine and the “reporter” should be held accountable. ‘Accountable’ in this case means they must pay BIG money for all they have put the Lt. Col. – and his other Marines – through. That takes money. The Thomas Moore Law Centre site is here. In this war, more than ever, we have witnessed the lack of integrity from the mainstream media. They seemingly “can’t handle the truth.” What has become really evident in this whole debacle, specifically, is the fact that Time and the ‘reporter’ rushed to print with lies, with total disregard for not only the truth of the matter, but also what borders on treason for printing such propoganda fed to them by disreputable sources in a time when the country IS at war. They MUST pay, even though we all know that no amount of money will ever compensate any of these Marines and their families for what they have endured by domestic enemies! The Haditha Marines’ familes have been dragged through hell, because of the despicable, irresponsible behaviour of Murtha, and Time and their employee. The families have created many sites detailing their journeys, and to read any of them is to feel their pain. Both well worth reading, if you have a strong stomach. Last, but by no means least, we need to get political. Murtha has proved he is nothing but the lowest form of political animal, so it is time to enter that area too. Murtha has proved in the past he is severely lacking in integrity but this time he has gone waaaaaaaaay too far. THIS time, even former Marines disgustedly disown this “ex-Marine”. Lt. Colonel William Russell is a decorated combat veteran who has served in Desert Storm, the Iraq War, and the Pentagon on 9/11. That William Russell is on the ballot at all is a miracle. I think it would be poetic justice at its finest for this Lt. Col to whoop Murtha in the upcoming elections. And he can do it, if Americans help him, vote for him. Check out his site and see what YOU can do. Murtha MUST go! So, what are you waiting for? Join me as a “M***tha F***** and let’s get rid of Murtha. Cross posted at Assoluta Tranquillita and Tanker Bros. Filed under: Chessani, I am a M***ha F*****, Murtha, Russell |	Comments Off on I am a M**tha F*****! Yesterday, those of us who have been following the Haditha Marines case were rewarded with the news Lt. Col. Jeffrey Chessani had all charges against him dismissed. And about time, too. That’s seven out of eight, with one Marine left to be cleared. Today, on the heels of the news Chessani was looking into the possibility of suing not only Rep. John Murtha (an ex-Marine himself who threw these Marines under the bus by smearing them publicly by stating they were “cold blooded killers” and thereby tainting any possible jury pool and thereby effectively denying the Marines due process under the Constitution), but also Time magazine reporter Tim McGuirk, it came to light the government has filed an appeal in the case. With most of the eight Marines charged in the Haditha, Iraq, incident now exonerated, the highest-ranking officer among the accused, with the government trying to salvage its allegations against him on appeal, is considering a lawsuit against Democratic Rep. John Murtha, who fueled the case by declaring the men cold-blooded killers. In an interview with nationally syndicated radio talk host Michael Savage, the lead attorney for Lt. Col. Jeffrey Chessani said he and his client will look into suing Murtha and the Time magazine reporter Tim McGuirk, who first published the accusations by Iraqi insurgents. But the attorney, Brian Rooney, said nothing will happen immediately because he wants Chessani, described as a devout Christian and the father of six homeschooled children, completely “out of the woods” legally before any action is taken. The government, through Lt. Col. S.M. Sullivan, today filed a notice that it would appeal the case to the next judicial level. As WND reported, a military judge at Camp Pendleton in California yesterday dismissed charges that Chessani failed to properly investigate the Nov. 19, 2005 incident in which 24 Iraqi men, women and children were killed. Rooney, an attorney for the Thomas More Law Center who served a tour of duty in Iraq himself, is urging citizens to tell their representatives in Congress and military officials that they want the case to come to an end. “At some point you have to have somebody in the chain of command, whether it’s civilian or military, saying enough is enough,” said Rooney, who served with Chessani in the second battle of Fallujah. Rooney told Savage the Haditha case is the largest investigation in the history of the Naval Criminal Investigative Service, with 65 agents assigned by the government. The filing of charges against Chessani was approved by Gen. James Mattis, then commander of the Marine Corps Forces Central Command and commander of the 1st Marine Expeditionary Force at Camp Pendleton. Mattis has been promoted to commander of NATO’s Supreme Allied Commander Transformation and commander of U.S. Joint Forces. He noted the New York Times featured the case on the front page when it was being compared by war critics to the infamous My Lai massacre in Vietnam. But now, with evidence the Haditha accusations were a smear, the story has been relegated to the back pages. The military judge, Col. Steve Folsom, dismissed Chessani’s charges without prejudice, giving permission for the prosecutors to continue trying to build a case that began in December 2006. Four Marines were charged with murder and another four with not properly investigating the incident. Defense lawyers contend insurgents deliberately attacked the Marines from hiding places where they surrounded themselves with civilians to use as shields. The defense insisted Chessani promptly reported the events to his superiors and that nobody in the chain of command believed there was any wrongdoing on the part of the Marines. Rooney acknowledged to Savage it’s difficult to sue a sitting congressman, but he believes it can be done. “If he leaves his realm of speaking from the congressman’s point of view … then he can be sued for libel and defamation,” Rooney said. “All the information I get, it comes from the commanders, it comes from people who know what they’re talking about,” Murtha told reporters at the time. Murtha’s assertions, however, conflicted with results from the military’s own investigations. An initial probe by Army Col. G.A. Watt found no indications coalition forces “intentionally targeted, engaged and killed noncombatants.” Later, Army Maj. Gen. Aldon Bargewell found no cover-up. Nevertheless, the Marine Corps eventually brought charges against Chessani and seven other Marines. But now the cases against Lance Cpls. Stephen Tatum and Justin Sharratt, Capts. Randy Stone and Lucas McConnell and Sgt. Sanick P. Dela Cruz have been dropped. First Lt. Andrew Grayson has been acquitted, leaving only the case of Staff Sgt. Frank Wuterich untested in court and Chessani prosecutors facing the hurdles of the appeal process. WND previously reported a military jury of seven officers acquitted Grayson of all charges. The ruling by Col. Folsom yesterday followed a previous decision in which he confirmed evidence of unlawful command influence. The evidence indicated two generals who controlled Chessani’s case were influenced by Marine lawyer Col. John Ewers, who was allowed to attend at least 25 closed-session meetings in which the case was discussed. Rooney acknowledged the Haditha case taken a toll on the Marine Corps. Rooney was asked by Savage why he thought Murtha, a former Marine himself, accused the officers and enlisted men. He hopes soon politicians will weigh in on the case in support of Chessani and the others. “I would think all politicians, especially politicians that have military records, should say something about this case,” he said. Maybe Murtha’s not able to handle TWO lawsuits filed against him for his big fat mouth? Remember about 100 years ago in internet time, another of the slandered Marines, Sgt. Frank Wuterich (the last Marine waiting exoneration) has already filed suit–Hot Air has that report here. If I properly recall, Murtha was not allowed to “talk” his way out of testifying in that case regarding his actions. Yes, I do recall properly and The Crypt at Politico has that story here. So, WHEN is Murtha going to apologize? How about, in a real good Samaritan turn Murtha call an end to this nonsense once and for all. Wow, those crickets are loud! Well, at least for Rep Murtha. He has some ‘splainin’ to do in more ways than one. As you will recall, or not, some time ago, via some shady goings on, LTC William Russell was removed from the PA ballot and it was concocted at such a time that there would not be enough time to go around and run a round to get the signatures that he needed. The next order of battle was to have at least 1,000 PA voters in the 12th District write in the name of William Russell. Primary day came and went and lo and behold, miracles of miracles, the goal was not only met but was exceeded and they are still counting them. Tonight, LTC William Russell will be on the American Truth Warriors Blog Talk Radio show at 1900 hours EST (7 PM EST for you civilians). He will explain The Why he started in on this journey and how he overcame the back door shenanigans of the man he seeks to unseat this November. Please join us as an Iraq War Veteran blazes a new path to bring Truth, Justice and the American Way back to the tainted and dishonorable halls of CONgress. His web site is here and the other Iraq War Veterans blazing the same trails can be found here. Tune in here and listen and/or participate in the chat room…we will have to register with BTR to chat…guests are welcome but guests cannot participate in the chat room. Not my rule. The call-in number to ask LTC Russell questions is 646-652-2670.